This is the second part of a five-part series looking back at the Indian Ocean tsunami. At that point Aceh had been under a “military emergency” (following a period of full martial law) for more than a year as Jakarta responded to an increasingly violent separatist conflict that had pitted GAM against the Indonesian army (TNI) since the 1970s. When the ocean swallowed much of the province’s coastline, it did more than liberate Irwandi, who had been captured by Indonesian intelligence months earlier in Jakarta: the disaster halted the violence to give space for humanitarian response and unprecedented cooperation between Jakarta and the rebels. As aid money and agencies poured in, humanitarian actors had to make delicate decisions about how to allocate disaster relief funds and re-build a province already ravaged by war.Fresh rounds of peace negotiations started months after the disaster, and within a year of the tsunami, GAM was disarmed, TNI operations ratcheted back, and post-conflict programming after three decades of fighting was under way. “During martial law, Jakarta kept Aceh closed and isolated. But the tsunami opened up the gate completely. All of a sudden the eyes of the world were on Aceh so the government had to engage with us,” Iqbal Farabi, an Acehnese human rights lawyer who worked at the Legal Aid Foundation and the government reconstruction agency (BRR), told IRIN. 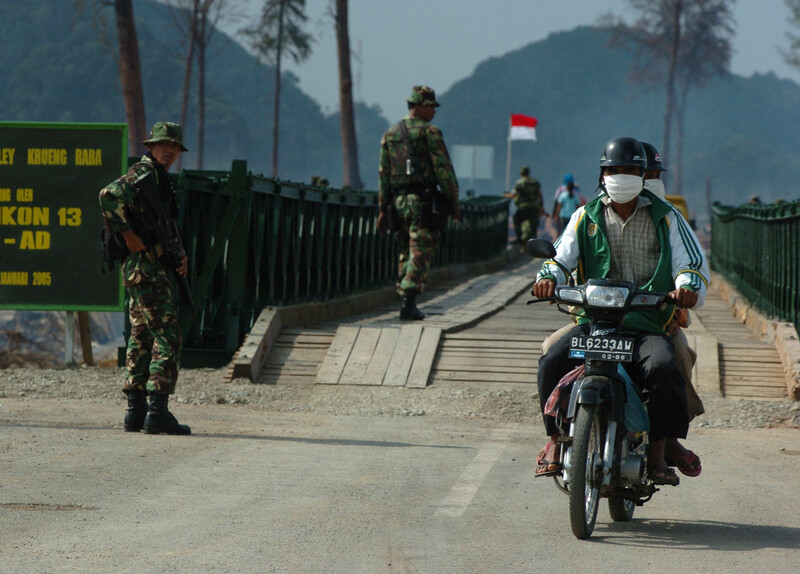 “Jakarta knew that if they didn’t lift military emergency law, reconstruction was going to be impossible,” he said, referring to what then World Bank researcher Patrick Barron called “a face-saving opportunity for both sides”. Aceh’s history is riddled with spats of conflict. In 1950 when Jakarta diluted Aceh’s then de facto autonomy by declaring it a part of Sumatra Province, violent resistance led the Indonesian capital to restore provincial status and cultural and religious decision-making. But by the late 1970s, secessionist sentiments had peaked again, in part due to oil and gas extraction in Aceh further fuelling resentment of Jakarta when little of the profits benefited Acehnese people. GAM took shape in the 1970s, and waged a violent independence fight that had significant humanitarian impact on civilians. Iskander (one name only), who works for the local government in Lhokseumawe on Aceh’s east coast, explained that as certain communities were selected as recipients, visible changes fomented local tensions. On 15 August 2005, less than eight months after the disaster, a peace deal (MOU) was signed between GAM and Jakarta, including provisions to disarm the rebels, and that Aceh would not be independent but “self-governed,” including being allowed to form local political parties there, which Jakarta had previously outlawed. GAM retained substantial political clout in peace time, including by what Aspinall called “predatory exploitation of post-tsunami and post-conflict reconstruction” to win contracts and dole out jobs and money to ex-combatant networks. Irwandi, who had initially fled Aceh so as not to be apprehended again, won Aceh’s governorship in December 2006, largely thanks to young GAM-aligned voters. He took a hard line against corruption and even banned logging (a major income source for GAM and TNI during the war). According to the International Crisis Group (ICG) in 2007, Irwandi was “popular and free from any taint of corruption or abuse of power but is coming under fire for… having no idea of how to make or implement policy.” Divisions within GAM’s political operations were quickly deepening, and public dissatisfaction with former rebels governing was growing. Political squabbling (including GAM supporters splitting into two parties in 2012) and weak governance has meant Aceh continues to be tormented by sluggish development, low-level violence and intimidation, and growing popular dissatisfaction. Beginning in 2008 Aceh received a Special Autonomy Fund (SAF) from the central Indonesian government, pegged as a percentage of oil revenues worth hundreds of millions of dollars, and “intended to fund the development and maintenance of infrastructure, people economic empowerment, poverty eradication, and finance the education, social, and health sectors.” In 2012 a researcher at the Institute of Aceh and Indian Ocean Studies (ICAIOS) found, however, that ineffective planning for SAF funds in its first two years had increased the Human Development Index gap between Aceh and the rest of Indonesia. Dissatisfaction continues to fester among former combatants as well. In recent months, some ex-GAM factions have threatened to take up arms due to their disappointment with the government. A former GAM soldier living in the eastern coastal city of Biruen showed IRIN a video clip on his phone from the late 1990s with TNI soldiers beating Acehnese men in public.